Many of us recognize the unfortunate stigma that remains in society when it comes to openly discussing our own or our loved ones depression and/or mental health. Yet, as Paolo del Vecchio, M.S.W and Director of Mental Health at SAMHSA shares on his recent blog, less than 1/3 of those with mental health challenges receive treatment. This must change. Many of the images we are bombarded with in the media depict colorless and isolating scenes of those with depression, full of silent expressions of shame, hopelessness, and grief. While this may be a key symptom of someone in the middle of a major depressive episode, the fact remains that depression is treatable and many find this experience their greatest gift. All that is needed is for them to make it through the pain and find their way to light. Today on this Mental Health Blog Day, I would like to share my journey out of isolation. It all started with planting a sunflower. In 2009, I lost my mom to suicide. She fell into a clinical depression in 2008 after undergoing some medication changes. She suffered silently and lived in great fear of anyone finding out. My dad and I knew of her struggle and did our best with the information we had at the time to help her. But we also lived in isolation. She begged for us not to ever share her suffering. She saw herself as damaged goods and less than others. As family members, we honored her request for privacy. We only spoke to her doctors. No one else in our family knew of her struggle. She hid it from her siblings, extended family, and dear friends; the people who truly loved and cared for her happiness and well-being. The stigma of depression had robbed our family of much needed guidance and support. In my time of healing, I came across iFred’s message to “Shine a Light on Depression”. When researching the topic, this was something I had never seen. 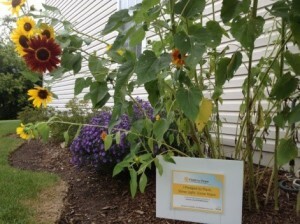 Seeing the beautiful sunflowers accompanied by the inspirational message that there is hope was very welcoming. All around the world, sunflowers were being planted to honor the World Health Organization’s most recent statistic of the 350 million who experience depression. I read about their Field for Hope project and knew I wanted to be a part of it. I initially donated one dollar to have a sunflower planted in my mom’s honor, and it spiraled from there. Next, I decided to plant my own garden which inspired Gardens for Hope. The sight of the sunflowers outside my window I knew would help cheer me. I printed a sign from the website and posted it in my yard that I was “Shining a Light of Hope on Depression.” What happened next came as a wonderful surprise. Conversations were started in regards to my sunflower planting with my family and friends…and then neighbors. People wanted to know about the project and its message. Having the opportunity to open up the subject in such a positive way connected me to others in a way I never thought possible. I was amazed at the response I received. It truly opened the door for sharing experiences. From my backyard, I saw my own pathway to continue the conversation. A farm located behind my home grows sunflowers in their field each season. So I decided to approach the farmer and ask if they would be interested in donating their sunflowers to the cause by displaying a Field for Hope sign. She immediately agreed and had her own stories to share. With every visitor to her local farm stand, another community member was reached. Once the conversations got started, I found it easier to share. After posting on Facebook and Twitter, I received hundreds of messages. People thanked me for talking about it. Many then shared their stories with me. I began to see that by shining my light on depression, it encouraged others to shine theirs. I believe as we continue to have the conversation, we will indeed reduce the stigma by creating awareness and knowledge…and that all of us are most definitely not alone. 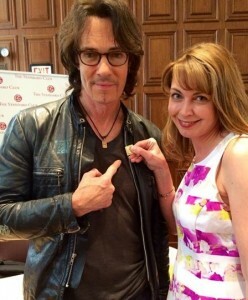 iFred saw the work I was doing, and asked me to come on their team to help #teachhope to kids dealing with depression and talk to celebrities like Rick Springfield to help end stigma with #famousfaces. When I learned that research suggests HOPE is teachable, I got on board. So we are now creating a curriculum that is being tested in schools across the country called Schools for Hope. For me, it started with planting a sunflower and sharing my story. Now I am no longer isolated. My fear has dissipated. I talk about depression. I talk about available treatment. I am the voice for my mom. I am proud to talk about the wonderful human being she was and I do not define her life by her death. She was an amazing mother, wife, sister, friend, and the list goes on. And she had depression. She lost her life to an illness that we are afraid to talk about. This needs to change. Never underestimate the power of your own voice and your own story. Someone will be listening. Just begin the conversation and plant your seed. Shine Your Light for Hope.